To reconnect to the vitality of your life force and your heartfelt feelings, realizing that ample energy and resources are available. Fives are content-focused, clear, analytical and wordy, but not big on “small talk.” Others may perceive Fives as emotionally disconnected, aloof, over-analytical and distant. I have a strong need for privacy. I limit intrusion from a world that wants too much from me. I hoard time, space, energy, knowledge and myself. I detach from feelings and observe rather than participate. Respect their need for privacy (understanding this is not rejection). Make it safe for them to share themselves, especially their feelings, giving them the space needed to do so. Approach them slowly and thoughtfully, and avoid pressuring them for immediate contact or fast decisions. Join them in talking about ideas and valuing the inner life. Don’t make assumptions about what’s going on with them. Ask them for direct communication. With a focus on intellect and gathering knowledge, Fives are often scholars or technical experts with keen perception and analytical abilities. They need privacy and personal autonomy because they often experience other people as intrusive. Their detachment from others and from emotional pressure creates a sense of personal freedom, but also can lead to loneliness. Fives need to balance their tendency to withdraw or withhold by reaching out to others, even if this involves discomfort or conflict. You can assure survival and gain protection from intrusion and insufficient resources through privacy, self-sufficiency, limiting desires and acquiring knowledge. Fives use isolation to avoid experiencing inner emptiness and to maintain a self-image of being knowledgeable. Gathering information becomes a way to create safety and self-worth, yet overemphasizing the intellect prevents Fives from connecting with the life force in their bodies and the support available in relationship with others. In what ways do I react when I feel intruded upon? How do I maintain a sense of safety by erecting boundaries and limiting contact with others? How do I avoid emotions and stay in my head? When do I fall into analysis paralysis? How do I minimize my wants and desires? How am I withholding or stingy? Type Five’s journey is to reconnect with feelings and move forward into life-giving energy. While everyone has concerns about the potential scarcity of emotional connection or supplies to sustain life and well being, this is the central issue for Observers. In reaction, Fives retract into the mind, detach from feelings and emotional claims, and conserve their energy by reducing needs and pursuing self-sufficiency. Their path of integration involves reversing this process. By expanding into feelings, experience and connection, more life energy naturally becomes available. Letting go of attachment relieves suffering. A rich life means embracing the full range of human experience. Being present and engaged with others expands our available resources. Generosity includes receiving as well as giving. Knowledge is more than gathering facts and ideas; true wisdom comes from within. 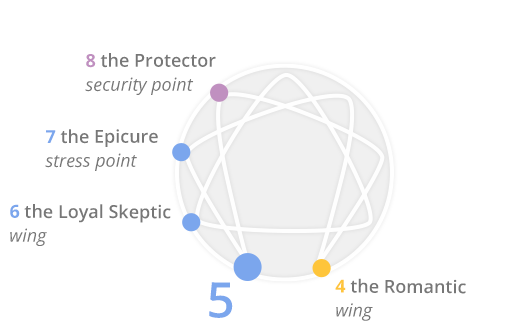 As thinking types, Fives seek to develop knowledge and expertise while protecting their privacy and autonomy. They tend to stay in their heads and avoid experiencing body sensations or feelings. Sensitive to sound, touch and intrusion, Fives hold tension mostly in the gut (instead of musculature). Your task is to connect with your body and emotions. While we all unconsciously hold our breath to avoid scary or overwhelming feelings and sensations, as a chronic defensive strategy, it constricts your vitality and keeps you in your head. This may seem safe, but being in your body offers a new kind of security. Focus on slowly expanding your diaphragm and deepening your breath. You may feel uncomfortable or even anxious at first. But take it one breath at a time, learning to tolerate increased sensation. With continued practice you will access the abundant energy of your instincts, increase your capacity for pleasure and sensation, and make better contact with other people and the physical environment.